Double Award winner at the SXSW 2019 Hackathon. We curate a brand new list of artist for you, based on where you are heading to and adjusted to your listening preferences. We suggest new places, venues and restaurants based on your music preferences. The kind of places that don't show up on tourist guides. 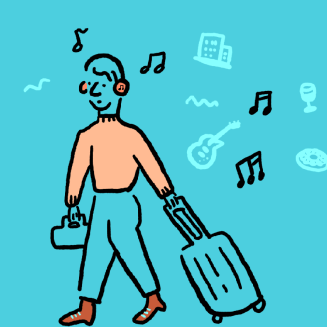 Based on your trip dates and music preferences, we tell you the events you can't miss. Going to London and you love Reggae? We'll say try some Natiruts to get you in the mood. While there you can't miss Brixton and Hootananny as a concert venue, and why not stop by the David Bowie memorial? Use your Spotify login and we'll get your top artists and genres. Guilty pleasures in there? You can always add and remove to adjust your trip profile. We'll extract the top music trends going on and best venues. Our suggestions take into account both your personal preferences and what your destination is good at. So we can provide original suggestions every time.